A sermon preached on Trinity Sunday at Southminster Presbyterian Church. Today is Trinity Sunday, which is where the lectionary writers punish preachers who had so much fun last week on Pentecost Sunday by foisting upon us today the most complicated and obfuscating texts and expecting us to make the Doctrine of the Trinity clear for each of you. And, as you notice, the text you heard this morning is neither of the texts I thought I would be preaching from. I confess we won’t be spending much time in Isaiah, but I hope you got a sense of the mystery of God that Isaiah experienced in his call story. You get a sense that even as he was writing it down, he thought, ‘nobody’s going to believe this, but what can I do?’ God is a mystery. God is Holy. God is beyond our comprehension and our control. And considering the Trinity, the triune nature of God is more mysterious still. So, before we go much further, let’s frame our discussion so we can all be nearly on the same page. Trinity is more than just a character from the Matrix movies. 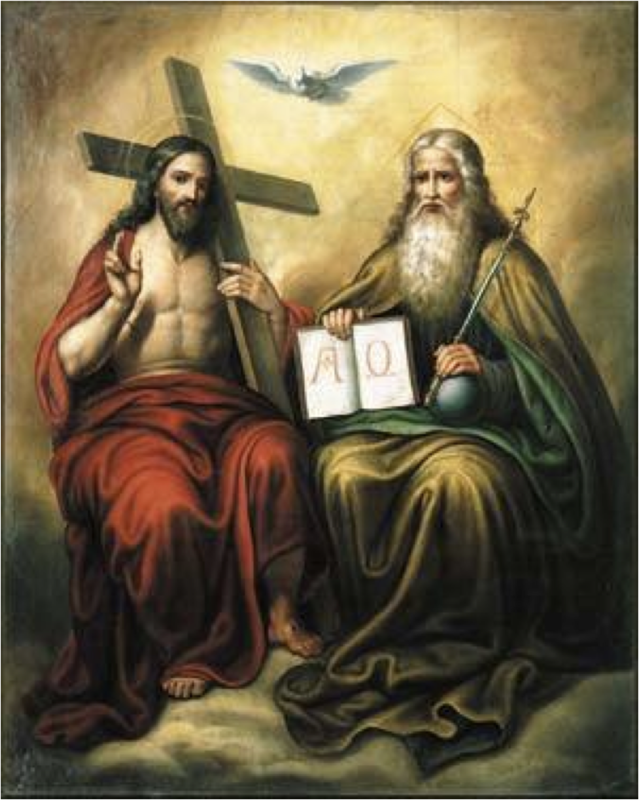 Here is an image of the three persons of the Trinity. Father, Son, Holy Spirit, as played by two white men and a bird. Jesus is the one with the cross, if you were wondering. This next image is a famous 14th century icon by Andrei Rublev. This comes from Abraham’s experience in Genesis. He encounters three visitors and provides them with hospitality. Because of his hospitality, they pronounce a blessing—that Abraham’s wife Sarah will bear a child in their old age. From the earliest days of the church’s wrestling with this concept of Trinity, they have looked back at this text, of the three holy visitors, bringing blessing to Abraham. This next slide is contemporary. 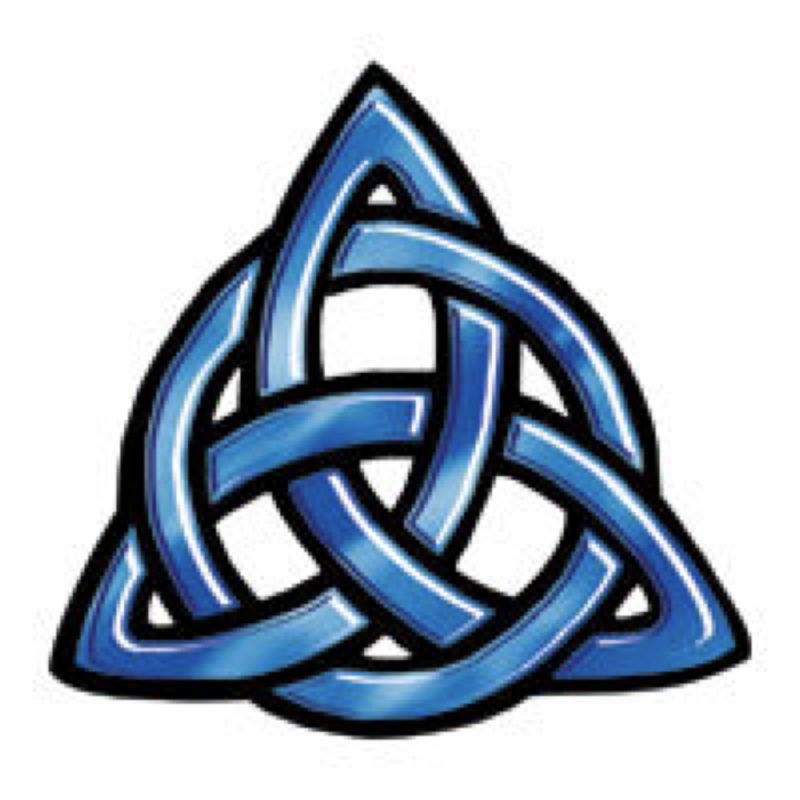 And the final image is of a Celtic Trinity knot. Similar to the previous picture, the Celtic knot is one, unbroken line connecting the three, with no beginning and no ending. This trinity is surrounded by a circle, symbol of divine eternity. Before we start considering what the Trinity is, we’re going to look at what the Trinity is not, at how the relationship of the three does not function. And, as we begin to do that, I’m going to cite the great church father, Augustine, who said, “If you comprehend something, it is not God.” The doctrine of the Trinity is not supposed to be easy or simple. God is a mystery far beyond our ability to understand. So, give yourself permission to be flummoxed. And remember, it took the church four hundred years and many church councils to come up with this, to struggle over this. We don’t often get to talk about heresies in the Presbyterian Church, but here we go!!! Because most heresies are, at heart, a Trinitarian problem. So what is the Trinity not? The first heresy of the day is called SUBORDINATIONISM. In subordinationism, you regard one person of the Trinity as more important than the others. For most people, this involves thinking of God the Father as the “big kahuna” or the boss man of the Trinity, with Jesus and the Holy Spirit as his lesser, subordinated, minions. So, if you don’t see the three persons of the Trinity as equal partners, this would be subordinationism. You can also, if you so choose, commit this heresy with either the second or third persons of the Trinity. Some Christians, in their language, only speak of Jesus, for example. If a personal relationship with Jesus Christ is the only important part of your faith, you’ve got a case of Second Person Subordinationism. The movement of the Spirit is irrelevant and God the first person of the Trinity is relegated to the history of the Old Testament. Or you can focus your worship only on God as Spirit, emphasizing private spirituality at the expense of God’s work of creation and salvation. Subordinationism, then, is seeing one person of the Trinity, or the work of one person of the Trinity, as more important then the work of the others. 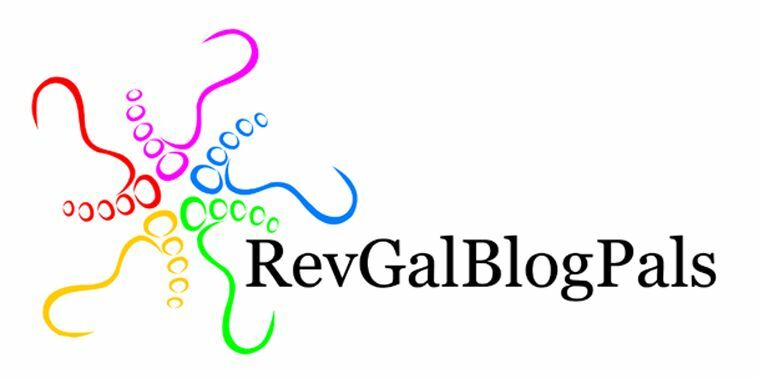 Our second heresy of the day is…..drum roll please…..is MODALISM! In modalism, you focus too much on the oneness of God and see the work of the three persons of the Trinity as one character in three different roles, or modes. Or God wearing three different hats. One problem with viewing the Trinity this way is that Jesus’ humanity becomes a problem. If Jesus, the second person of the Trinity, is really just God wearing a human costume, then was he really human? The third, and final, heresy of the day, is TRI-THEISM. In this heresy, you don’t worry so much about the “oneness” of God at all. You just have three separate Gods. But God is not a pie. You can’t slice God into three separate pieces. So, what do we mean when we say God is Triune? We don’t have Trinity Sunday so you can adhere to correct doctrine. I’m not going to burn any heretics today. The Trinity matters because if we believe that Jesus is God made flesh, we cannot talk about God apart from the revelation of God in the person of Jesus Christ. The relationship in and between God the Creater, Jesus the Christ, and the Holy Spirit are worth pondering. The Trinity matters because it is the theological grammar by which Christians understand the God of scripture. The Trinity matters because of relationship. 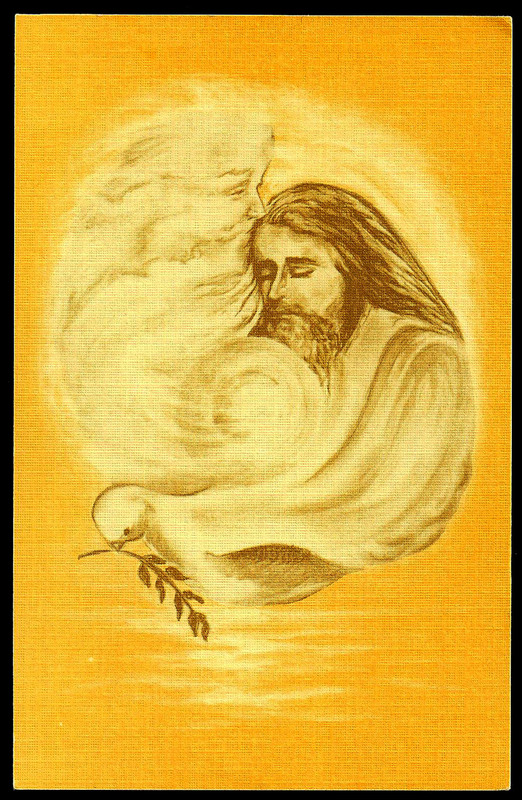 The three persons of God are in relationship with each other. Not a relationship of hierarchy. Or of separate divisions of labor. But a relationship of connectedness. Of integral need of and for the other. To confess that God is triune is to affirm that God exists in communion far deeper than the relationships and partnerships we know in our human experience. This perfect community that is in God’s very being can help us think of how we live in community. Any notion of faith as a private business, uninvolved with the well-being of those around you, is non-Trinitarian. If a person were to say, “I’ve accepted Jesus as my Lord and Savior, so I’m going to heaven. If other people choose not to accept Jesus, I don’t have to worry about them. They’ve made their choice.”—if someone were to say that, they would be denying the interconnectedness of all creation. Our faith may be a personal decision—you decide or not to be a follower of Jesus—but it is never a private decision. Once you become a part of the community, the community matters. God exists in community and God made us to exist in community. The Trinity matters because it also means God exists in diversity. The very nature of God is diverse. Creator. Redeemer. Sustainer. Spirit. Word made flesh. That God exists in unity does not mean that God exists in uniformity. Since God exists in diversity, we are expected to seek out diversity as well. I’d like you to watch this video about music in worship. This is Richard Twiss, a member of the Rosebud Lakota Sioux tribe. (The video can be seen at http://www.theworkofthepeople.com. It is called “My Neighbor’s Music). We’re about to come to the Table. It is not our table. We are just a few of the many guests at God’s Table. And as you come to the Table, and as you go out into the world, come as you are, as God made you. And allow others to come as God made them. And come to the Table knowing that the diversity you see around the Table and around the world might just give us the best chance we have of catching a glimpse of God the Father, God the Son, and God the Holy Spirit. Amen. June 8, 2009 in Isaiah 6:1-8, Trinity Sunday.